TIP: Don’t be afraid to use large or oversize accessories. 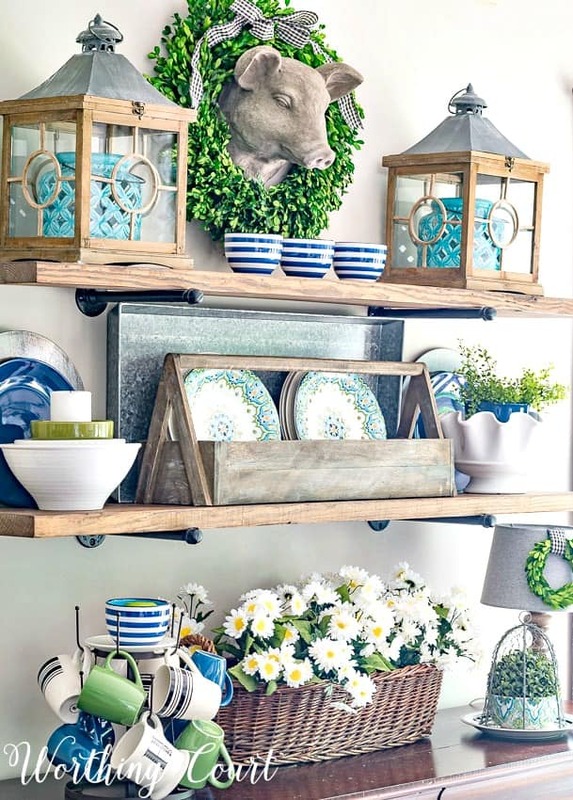 Here, the lanterns on the top shelf are huge, but add so much oomph to the overall appeal. The key is to use something large enough to make an impact, but not so large that it overwhelms the space or everything around it. 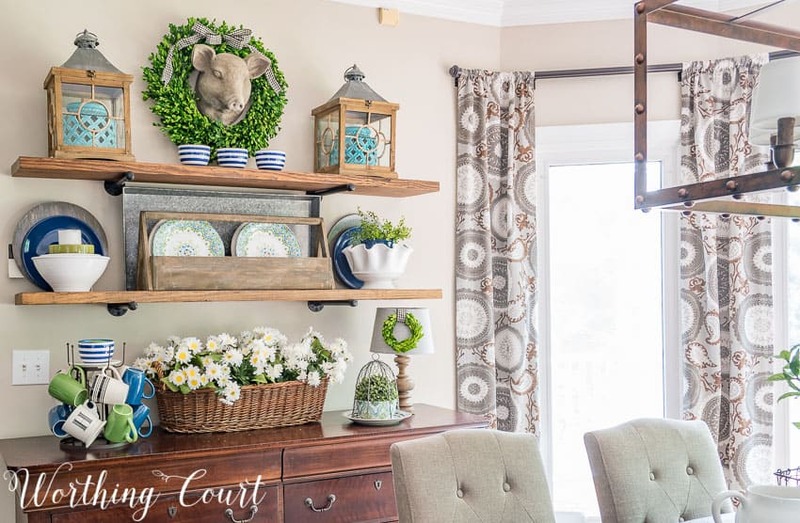 For the summer this year, I chose to carry over the blue with touches of green decor from my summer dining room into the breakfast area. I don’t know why I haven’t used this color combination in a bigger way before because I truly love it! I’m all about KISS decorating, so you’ll see that I kept several of the same elements from my shelves decorated for spring, but I did manage to change a few things. First up is this awesome basket that I found at a flea market a few weeks ago. Filled with a riot of daisies, it literally screams (ok, maybe yells) summer to me! I added blue and green plates to my reproduction vintage toolbox and blue plates from the dollar store on the shelf on either side of it. The plates are backed with my diy driftwood look chargers to give them more presence. The blue and green plates were found on clearance a few years ago and are no longer available. 🙁 The blue mugs are from the dollar store too and the blue and white striped bowls were used on our July 4th celebration table last summer. Love them! 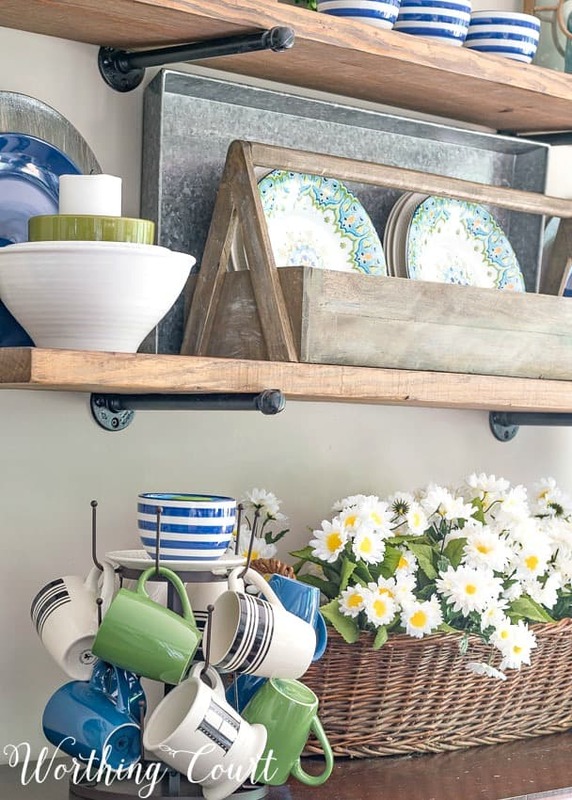 TIP: If your shelves are looking a little plain, try using a large tray behind your accessories. The tray will help to “ground” the display and draw your eye to the area. 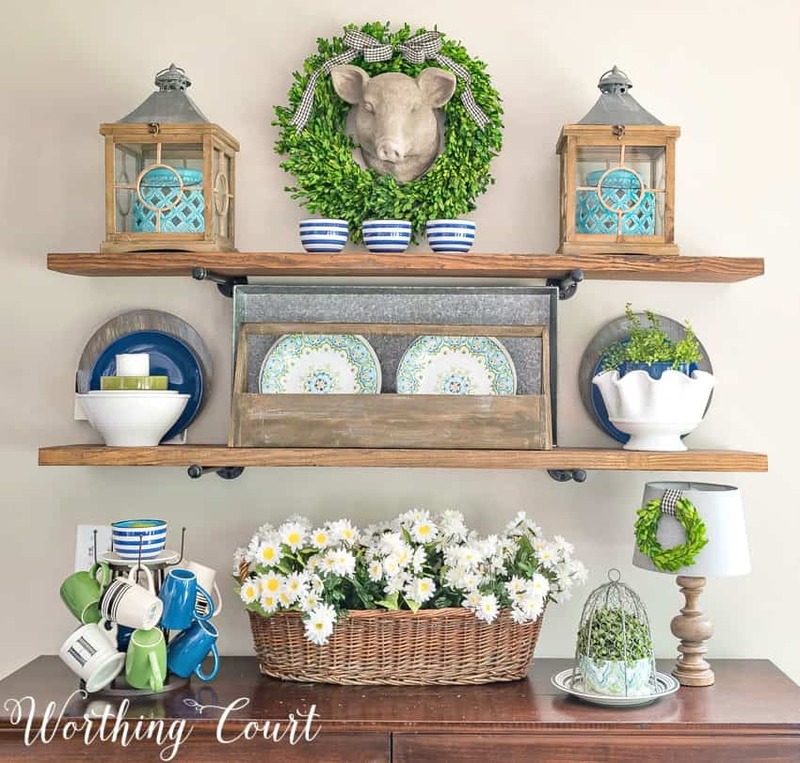 On the other end of the sideboard, my little buffet lamp still sports its mini boxwood wreath, for the summer I added a boxwood orb in a blue and white bowl and nestled them under a chicken wire cloche. And of course I can’t forget to give the honorable mention to Mr. Hubert. He still reigns supreme above the shelves and I don’t foresee him giving up his spot anytime soon! ONE FINAL TIP: When decorating a spot, or even a whole room, the area will look much more pleasing to the eye when you use a common theme. I’m not talking about being match’y-match’y. I’m talking about using some of the same elements throughout the area. For my shelves, I used a blue, green and white theme and repeated it over and over, but in different ways. Lovely vignette. I always enjoy your posts and they give me loads of decorating ideas. That looks great! I love blue and green! So bummed those blue and green plates are no longer available as I would love to add them to my collection. Thanks for sharing your great decorating ideas. You give me so much inspiration. Very pretty & well-balanced vignette. Mr. Hubert approves. This is my favorite!!! I love this, reminds me I need to put up my big shelf for displaying. Your open shelves always have the loveliest of vignettes! I enjoy seeing how you will change it up for each holiday and season — and it gives me so many great ideas! I like the idea of using a color pallet on your shelves. I am currently putting some shelves in my kitchen so I can use the inspiration. How beautiful! I love the colors you chose for your early summer shelf display. The blues, greens and aquas give off such an early summer feel to it! Very fresh, clean and bright. I love it! Love it!! Thanks for sharing and being such an inspiration. How pretty and fresh. Love the colors and thoughtful arrangement of each item. Your shelves are very pretty. I do believe that repetition of colour is the key. Love the touches of turquoise. My favorite! So sad to see the plates are not available, love those I also adore Hubert. Thanks for another day of inspiration. One of my favorites! Of course Mr. Hubert has to stay! I have open shelving also that were looking a little tired so used some of your inspiration now looking at them with a smile! I love this, would love to know where you got your shelves. I have been searching for some like this for an area in my kitchen. Your decor is beautiful! I love it! Even though everything is beautiful, my eye goes straight to the pops of green in all the right places. Seriously love this! 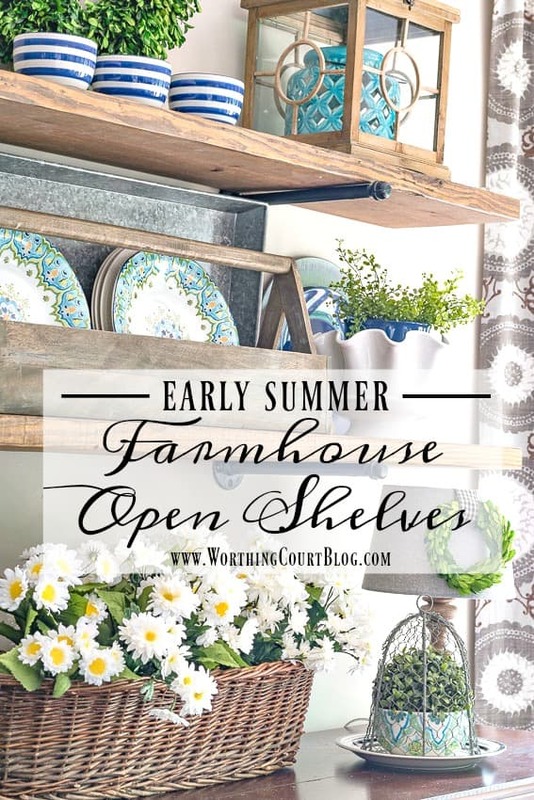 Your summer shelves look great! I love the green and blue together and the basket of daises is just perfect! I’m new to this blog and wonder: where, oh where, did you get Mr. Hubert????? I LOVE him. Your sense of style is inspiring. Thank you! Everything is so balanced and eye catching. I’m really loving the blue, green, and white colors, especially the plates, the blue lanterns, even the pig has caught my eye. Love it! I really like the piece you put in your big lantern. The blue and green are so fresh for summer. Very lovely! Lovely, the plates are Beautiful!!! Thanks for walking us through your process. I’m learning from you about how to layer items to create a fuller affect. So many times I look at my decor and think, “It just needs something else for depth.” I’ll put your ideas into action. It looks beautiful, Suzy! LOVE the blue/green theme. And those lanterns… sigh. 🙂 Where were those from? Oh, and a lantern inside a lantern! What?! Awesomeness! Hi Julie. I got those lanterns from an online farmhouse decor shop. Sadly, the shop closed a while back. Open shelves in the kitchen. I have them. I love them! I tell all to get them! 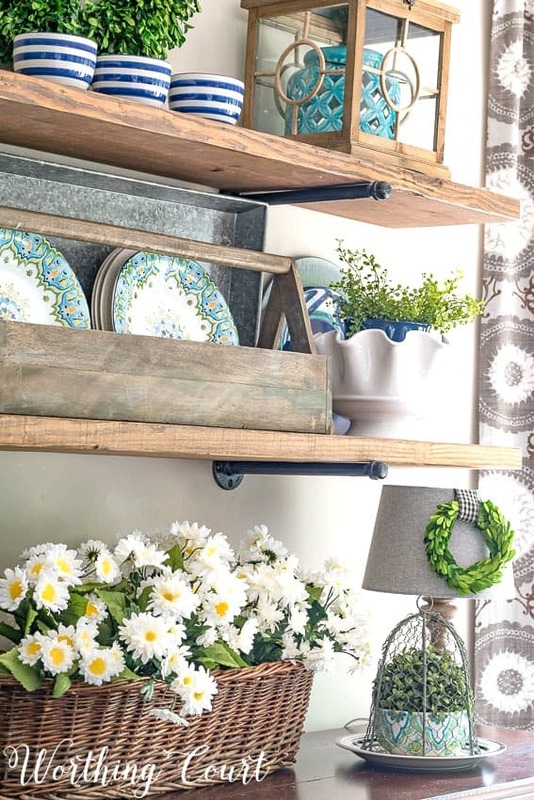 Your shelves are so nicely styled for summer! I like the vibrant greenery with the turquoise and blue accents against a neutral background. It’s very effective — casual, but pulled-together, with a nod to nature. I love your style! And how refreshing to see color mixed in! I love the look on your shelf and they way it carried down the buffet. Great tips on how to decorate too. Thank you for sharing at Dishing it and Digging it link party. I love seeing what you have been up too. Your colors are so bright and cheery. I love your styling on your open shelves as well! Gawh!! Your shelves look amazing! I love the plates…i’m having an obsession with blue and white lately! Looks so beautiful! Beautiful beautiful!! I love the pops of colours and how put placed the blue lantern inside the wooden lanterns. So creative, so much inspiration! I really want some open shelves, and I think the only spot they can go is also OUR breakfast nook! I love the industrial look of the pipes and wood you used! Filed this one in my “do this soon” file! Great look, Suzy!